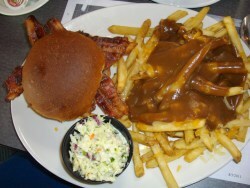 This week Burger Club evaluated a Winnipeg institution - Salisbury House. 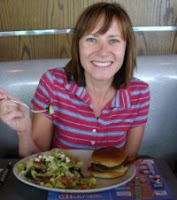 The burger was surprisingly good, but more about that later. 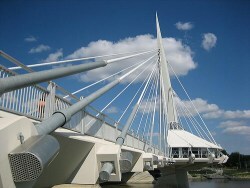 The main topic of discussion was how incredibly slow the service was at the Provencher location on the Esplanade Riel. It was a two hour lunch - but the view was great! 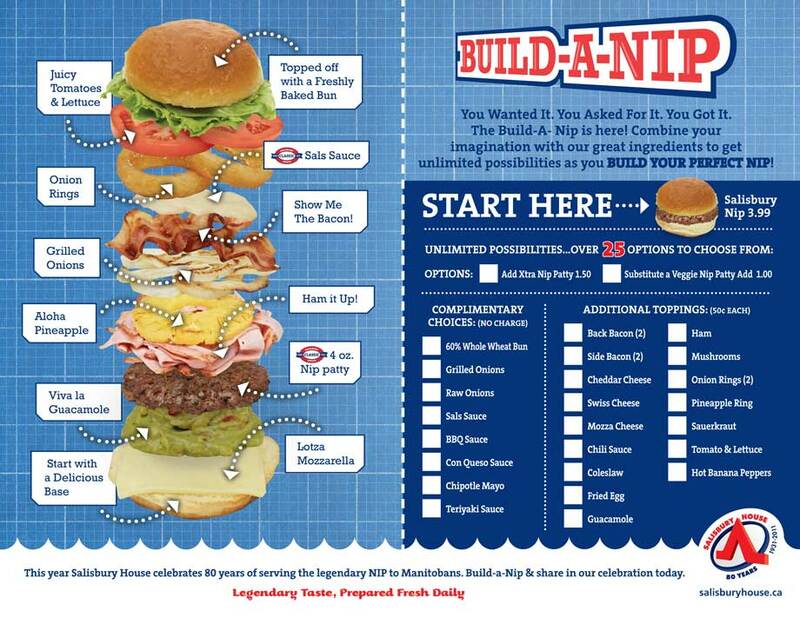 ﻿With the Build-a-Nip you specify your own burger - which means you get it just how you like it - but it also puts the responsibility back on the diner to choose items that work together. Cary lamented that he didn’t make good topping choices. I don’t think he made any choice - he checked everything off! 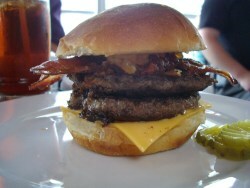 I specified a bacon-double cheeseburger and I gotta say, it was great! 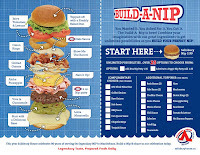 I’ve had Nips before and they’ve been disappointing - mainly due to the tiny little burger patty hidden in the bun. The Build-a-Nip burger came with a nice large, beefy tasting patty that filled the bun to its edge. 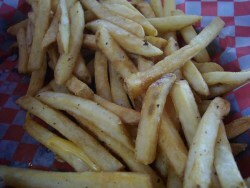 It was coarse ground and quite juicy - more watery than fatty. 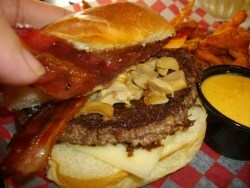 Word on the street is that the burger meets the grill as a ball of beef and then the cook squishes it with a spatula. 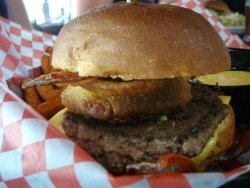 The grill must’ve been hot because there was a nice crust on the patty while it was still tender on the inside. A couple of comments about the toppings are that the mushrooms are canned and the “cheddar” cheese is a processed cheese slice. It wasn’t bad tasting for processed cheese, but disappointing if you’re expecting a slice of real cheddar. 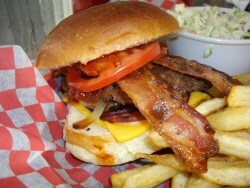 The bacon was delicious though - crispy to perfection! It was also a good deal - the additional toppings on the Build-a-Nip are all 50 cents - to keep the math simple I suppose - including the bacon. I also had the chili, which I quite enjoyed, and the chipotle mayo sauce which had a nice zing without competing with the rest of the flavours in my burger. The buns are baked fresh in the centralized commissary (where all the food served at Sals comes from) and then toasted at the restaurant. It was a nice soft bun and held up to the end. 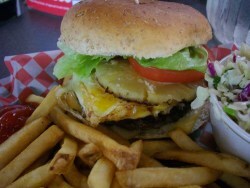 It was a messy burger though - mostly from the juice coming out of the patties - two in my case. Christie wrote that she “Enjoyed modeling my Little Red Riding Hood themed outfit.” Her t-shirt had an image of a hot air balloon and as she pointed out, sky should be over land so Christie’s skirt was covered in little trees - and of course - Little Red Riding Hood buttons moving through the forest. Awesome! 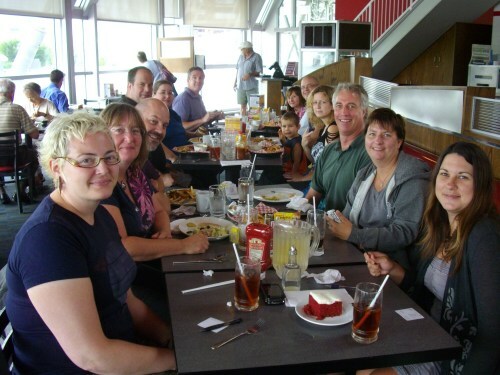 I so enjoyed reading this review by the Breakfast Connoisseurs I’m going to plug it here. 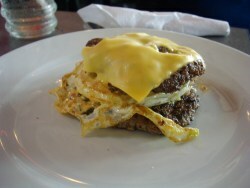 This is brave of me because it’s so much better than this blog that Burger Club readers will probably jump ship. I disagree with Cakeology red velvet being better than Sals... it doesn't help that one of the people working at Cakeology once bragged in my presence that their red velvet was better than Sals, but I still find Cakeology's red velvet dry.